We just got this message from someone who needs help naming their boat, and we think it's the bomb! Lots to go with here... from the name of their business, to the rivers they boat on, to the industry they work in. Please post your boat name suggestions as comments below. Our names are Wayne and Jackie, we have 2 kids (a boy and a girl). We import, wholesale, retail consumer fireworks, our brand of fireworks is called "Pyro King", our company name is Victory Fireworks, Inc.
We enjoy our boat on the St. Croix and Mississippi Rivers. 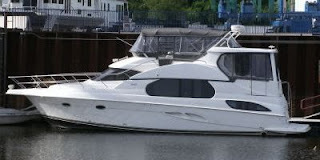 We are only able to enjoy the boat from July 5th thru the summer---short season for us!